Here We Have a Project at Mystic Bay Condo’s in Osage Beach, Missouri. My Blank Canvas of Concrete is Approximately 450sqft, we started by removing the railing, so we could grind some of the rough spots off of the surface, I call them concrete boogers or speed-bumps…lol. The next step was to repair some of the cracks that were noticeable, some were hairline cracks, some needed to be opened up to remove all the lose particles of concrete that were floating around within the crack. Once opened up I mixed up the Epoxy with some silica sand and laid it in the cracks. I came Back the Next day and did some slight grinding over where the cracks were. Then proceeded with our Decorative Concrete we lay out 2 base coats of Portland Cement with a Charcoal Colorant added in to the mix. This is my Grout Coat color you see. Next step was to mark out my pattern of a 20×20 tile pattern on a 45 degree pitch, but first needed to establish my boarder of 10 inches all around the perimeter of the slab, once done I began to tape it all out with Strapping Tape. Next came the Prepping of the walls so they don’t get spayed by the and the Tack Coat which I say in the Video (and Acid Stains), what that means is I simply mixed another bag of concrete with the same portion of colorant in it as the previous base coats, hooked up my compressor and hopper gun and sprayed the concrete on over the Strapping Tape, this is necessary for what we call in the industry as ‘Locking in the Grout Color’ to prevent any ‘BLEED UNDER” the tape from the 2 different colored Top coats and Acid stains going on to our Concrete Overlay in the next steps to come. Next I mixed another bag of our Portland Cement with A color Called Palomino, this was squeegeed this on top of the Charcoal Gray Color (tack coat), once dry I mixed up more of the same color and then added my texturing, I continued to layer my coats with My Trowel until I had the look I wanted. Next was to mix up the Acid Stains (Chemstone Acid Brown), once mixed I sprayed in a circular motion with a little water at first then the Acid went on over the water, this is to prevent any drops from the sprayer and it makes the acid feather out naturally on its on, this way it marbleizes much better. Once Dry I pulled the Concrete Strapping Tape up to reveal my Pattern and the 2 Base Coats of Charcoal Grey, cleaned it all up real well, then I mixed up my sealers, and Locked it all down, here is where the coloring just pops up and says HELLO!! I hope you Enjoyed the Video, the Pictures and the brief description of the process. When installing a floor, patio, or driveway, many people would love to have the unique colors and warm textures of natural stone. Slate, tile, brick, and even marble are some of the hottest materials on the market due to their sophisticated look and irreplaceable charm. However, any kind of natural stone comes at a heavy cost. Since they’re rare, difficult to manufacture, and harder to work with, they are never cheap. Therefore many people invest in cement: it’s easy, inexpensive, and effective. But recently homeowners have been able to find the best of both worlds: imitation natural stone. Whether inside or out, decorative concrete offers the look of natural stone without the price tag. This has become the most common form of decorative concrete today. Since wooden decks and porches are actually becoming a thing of the past, natural stone patios is the newest wave in exterior design. But it costs money. 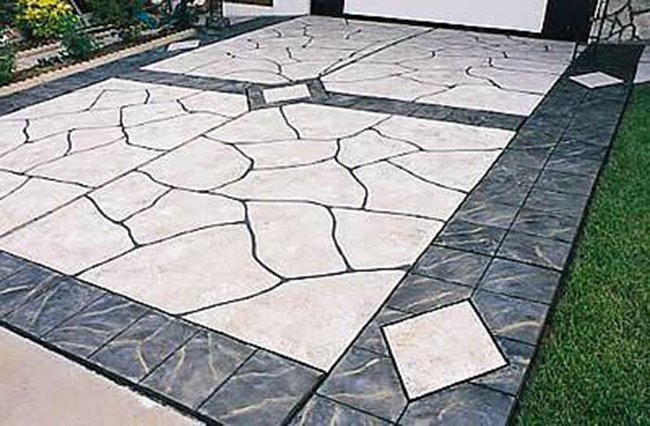 Therefore, stamping allows cement to take on the look of any natural product. During production, certain dyes are mixed into the product to create the right look. Then it’s laid like regular cement. Before it dries, a unique pattern is gently tamped into the wet material. So when it dries, it may look like brick pavers, but without all the work, maintenance, or expense. Cement eventually gets beat up by the weather, the cold, or simply by the years gone by. When it ages, you’re bound to see fading or cracks, so instead of breaking up the old and completely replacing it with the new, many homeowners choose to resurface. By applying a thin layer of fresh cement over the pre-existing product, many of the flaws can be sealed and covered. However, if you’re tired of the pitted, gray look of cement, think about decorative concrete resurfacing. While the holes and cracks are being repaired and covered, color can be added, along with engraved patterns and brushed textures, in order to imitate the breathtaking look of natural stone. Stain: An acid stain is applied over the top of an existing surface, wherein a chemical reaction occurs between the two substances and afterwards a permanent color stain appears. The real usefulness of this technique is the custom design. You can create swirls to replicate granite. You can design patterns to match the look of marble floors. It can even imitate wood and leather, giving you limitless options. Dyes: Simply another form of color staining, many contractors can literally paint the floors with a special spray-top dye. Texture: Not only can you spray on colors, you can spray on the texture you want as well. In the past, one could only apply designer texture during decorative concrete resurfacing (broom finishing the surface while it’s still wet), but now you can simply spray on the desired surface in order to gain the grain you want. Of course it doesn’t end there. Though the methods mentioned above are the more popular techniques, there are also stenciling, polishing, color flaking, epoxies, and many more options, some using a combination of these processes. But the main attraction is that decorative concrete is not only a fiscally wise alternative, it’s also limitless in terms of design choices, application, and location (don’t forget your garage floors, basement floors, pool decks, and stair steps). Call Me for a FREE Estimate!! What are Lake Ozark Decorative Concrete Costs?? Comments Off on What are Lake Ozark Decorative Concrete Costs?? Due to the many variables in decorative concrete projects, we are unable to give you a firm estimate without first speaking to you and/or seeing the project site. You can, however, get a rough idea of costs for your project from the information below. Click here to schedule a free estimate. The size of your project is an important factor in price per square foot. In general the larger your project, the lower the price per square foot. We have minimum square footages for decorative concrete (450 SF). Projects over 10,000 SF will have much lower prices per square foot than are outlined below. Please call for special pricing for large projects! We serve clients across Mid Missouri and Surrounding Area’s. Our mobilization costs will be factored in to your project estimate. These include costs for fuel based on mileage from our headquarters. Spalling concrete or cracked concrete will require repair prior to refinishing and repair costs will vary depending on the condition. Repair costs are not included in the estimates below. Special care needed to protect existing landscaping or structures may also add to your cost. Temperature and moisture are big factors that affect how long it will take to complete your project. Concrete takes much longer to cure and/or dry in cold, wet conditions. Some outdoor jobs that can be completed in one day during the summer, might take multiple trips during colder weather, thus increasing your cost. More complex patterns, colors and finish options will add to your cost. Extra charges for custom saw cuts, hand-staining, accent stencil’s or logo’s, and other specialty finishes will apply. There are many other factors that can affect the cost for your project, such as the need for caissons, steps, thickened edges, supports for posts, and special drainage considerations. Please inform us of any special circumstances that will affect your project. The cost estimates below are ranges for residential projects under 1000 SF. Remember, there are many variables affecting cost, so please call to understand costs for your specific situation. If you have a commercial project, please call for commercial pricing. We do NOT do this type of work, but these are common prices found. For up to 250 SF, costs for tearing out concrete is just under $3/SF. Beyond 250 SF, the cost varies between $1.75-$2/SF. Considerations such as thickness and rebar will affect the cost. We do NOT do this type of work, for pouring new concrete is $1800 (which covers up to 125 SF). If your project is between 125-200 SF the total cost will likely be around $2000. Above 200 SF, the price per SF starts around $10/SF, and drops to approximately $6/SF above 800 SF. If you want to add color to the concrete mix, you can expect to add between $.75-$2.25/SF, depending on color. The following estimates apply to projects between 500 SF to 5,000 SF. Please call us for an estimate if your project is larger than 10,000 SF. 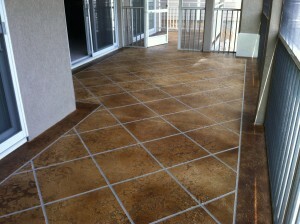 We can clean and re-seal your decorative concrete for a cost range of $0.90-$2.25/SF. We thoroughly clean and pressure wash the concrete, then we apply solvent-based sealer with slip resistance. What are the Benefits of Owning a Decorative Concrete Floor?? Comments Off on What are the Benefits of Owning a Decorative Concrete Floor?? Concrete flooring is an amazing flooring option for residential floors. Many homeowners are unaware of all of the benefits to concrete flooring, and they don’t realize that it is an easily accessible and affordable option. Concrete floors have been used for decades for commercial applications in stores and office buildings; most of those beautiful and shiny floors in department stores are finished concrete floors. Recently, the use of concrete as a residential flooring option has become more popular as more beautiful and economical techniques have become available, and word of mouth has spread about the amazing benefits of concrete floors. Concrete flooring is so durable that it has become a great option, economically. While you may pay a bit more upfront for the decorative concrete part of installation, you will see that in the long run you will have virtually no maintenance or need to replace concrete floors. It lasts longer, performs better and saves you money in the long run. No other flooring options provide as much choice in style and design. You can literally make any design you want with concrete flooring. 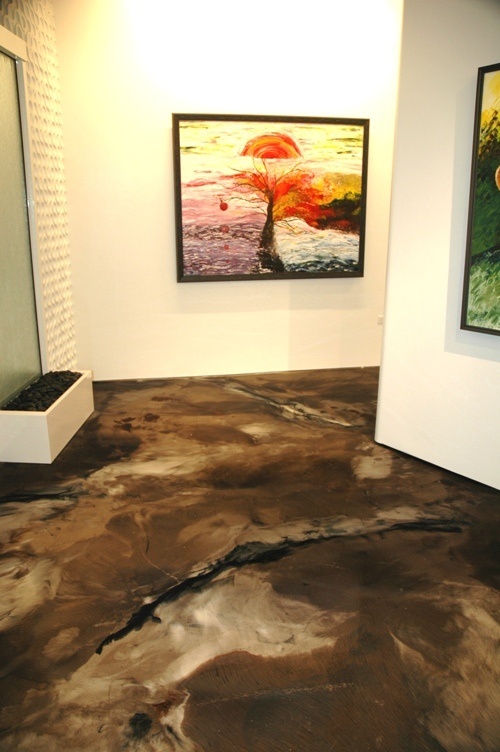 Once the concrete floor is installed, a concrete finisher or artist applies the artistic finish to the floor, which is what creates a beautiful look (as pictured above). You can choose to have the floor stenciled with borders or other designs or to replicate the look of ceramic tile or marble, among the many stylistic options. 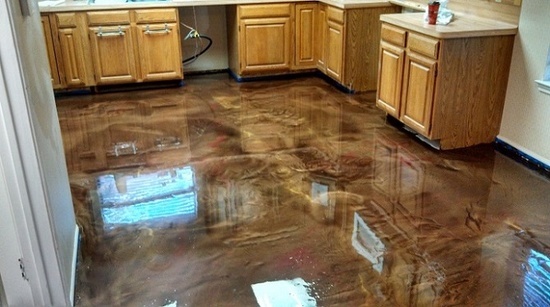 Concrete staining or polishing is another way to finish off the concrete floor. 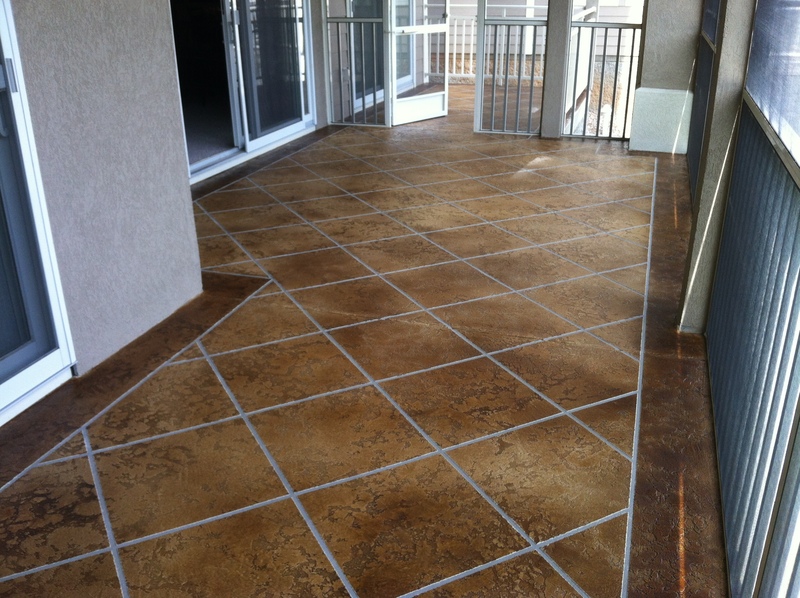 Your concrete contractor can provide you with the best staining options available. Concrete floors can be finished off in the sheen of your choice: high gloss or low gloss. A concrete floor installer and designer will work with you to make the best decisions for your floor so that the final product is stunning. No two concrete floors are alike. Create a unique style and design that is unmatched and special for your home. The three most popular ways to finish interior concrete floors are: staining and dyeing; polishing; and overlays and toppings. Some worry that a concrete floor will be cold and hard on their feet. The truth is that finished concrete floors are no colder or hard-feeling as other common flooring types like ceramic tiles, stone and marble. There is really no difference. In fact, having a concrete floor can be a benefit in the summer, as it might bring down your air conditioning costs since you will feel a bit cooler. Concrete floors also absorb the heat from the sun, so this is an added benefit in wintertime. Many homeowners who install concrete flooring also choose to install radiant heating cables underneath the concrete. This provides a little extra warmth to the floor and the room. This can also decrease your energy bills as it is more efficient than running a forced-air heating system. As with ceramic floors, the use of area rugs, curtains, wall fabrics and more can bring added warmth to the room. Concrete floors are no louder or echo-enhancing than other hard flooring surfaces. Using rugs, wall fabrics and more, as mentioned above, will not only help keep in the warmth, but it will also help decrease the sound. Especially with an added glossy finish, concrete floors can seem as if they are slippery. But the truth is that as long as your floor is installed by a professional, it should not be slippery. Standard practice dictates that a non-slip additive be added to the final finish of the floor. As mentioned above, there is virtually no maintenance with concrete floors. The amount of traffic your floors receive will determine the amount of maintenance it will need. A concrete floor with normal traffic will probably need a reapplication of the finish every 2 years. Keep in mind that concrete is the most abrasive-resistant and durable floor. Proper installation also means that you won’t have to worry about moisture vapors. Vapor barriers should be installed under the concrete slab to block moisture and dampness. Keep in mind that hiring a professional concrete floor installer is the best way to ensure that you won’t have problems later. Detail – Is it a basic application of stain or dye or more detailed design? Products used – Is the hardware store brand or professional grade? Concrete floors are an excellent option for those who suffer from allergies. Simple sweeping, dusting and mopping of concrete floors provides a much healthier option than carpet. There is much less dust and fewer dust mites around concrete than in carpet. The production of concrete flooring uses less energy when compared to other flooring types, especially carpet. Concrete does not involve the use of trees as hardwood floors do, and it is generally environmentally friendly. Call me for your Free Estimate Today! !